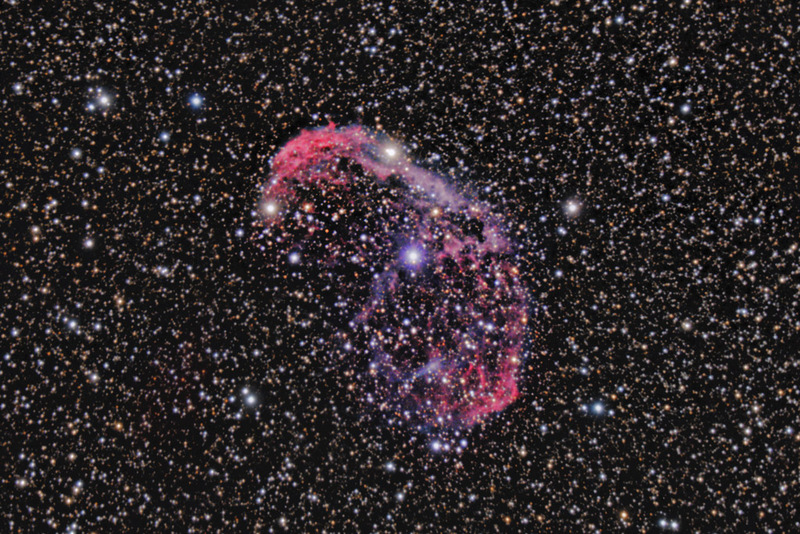 NGC 6888 is an emission nebula that features a bright central star. This star is classified as a "Wolf-Rayet" star and is a star that is nearing its end. The central star creates a strong steller wind as it sheds off its outer layers. This probably is the cause of the structure of the nebula. Eventually, the central star will end its life in a spectactular supernova explosion. In this image, North is Up. This image is cropped to 68% of the original. Software Used Images Plus 4.0 for camera control, calibration, stacking and digital development. Photoshop CS5 used for flat fielding, curves, color correction, saturation adjustments, star shrinking, noise reduction, and high pass filter. HLVG for additional color correction, Carboni Actions for noise reduction and additional saturation adjustments. Notes This is a beautiful nebula, particularly when you capture the outer wispy elements. Unfortunately, I wasn't able to pull out these outer edges in this image. Its still a pretty good picture, but I'll probably want to re-image this object sometime.